This is Shattered by O.A.R. This is also the very first time we tried this, and even more so that yesterday’s version of Down Under, this is very rough around the edges. Including a stop/start with my messing up on the chords in one part. But learning how to put a song together is just fun, and one of the best things about any musical creativity. We’ll also continue working on this one and see how it progresses. This is a first crack at doing a version of Down Under. My friend Dennis and I did this the other night. This is the first time we tried this particular song. I really like being in a the creative process when you can just dive in and try things, and you can sort of hear things working out as we go through it. Playing with harmonies and timings and guitar parts. We’ll keep working on this one, and see how it goes. It’s been a while since I’ve been able to be creative in the arts in any sustained way. I participated in a photo-a-day project for almost 2 years, and when one of the prompting services was discontinued, I discontinued too. I miss it, but haven’t been able to re-motivate my self to jump back in. Now that I’ve completed my MEd degree, I find myself thinking of ways to get some of that neglected creative stuff back into my routine. So I think that this summer will see a few projects undertaken. Photography – Both my wife and daughter like taking photos, and we’ve decided that, as a family, we’ll try and do a photo-a-day for the summer. We’ll post them all on my Flickr account. We may use a daily prompt site like Today’s Posting or we may just make up our own topic. Depends on the day. I think it should be fun a family. Music – I’ve been wanting to dig into using GarageBand, both on my Mac and on the iPad and iPhone. I’ve messed with them a little bit, but not extensively. I’m thinking that this summer, I’ll use these tools to post a song-a-day as well. I will record tunes as we sit around campfires, or where ever we happen to be. I’ve set up a SoundCloud account and will be using that for posting tunes. I’ve already recorded a few, and will be posting them daily. For a starter, I’ve embedded the first one below. It’s kind of a theme for the summer I’m hoping. 🙂 It’s a great tune by one of my favourite Canadian folk singers Ian Tamblyn. Now do I get a seat on the Jedi Council? What? It’s not THAT kind of Master? Nuts… Oh well. Its a great feeling to know that its fully completely finished after years of work and study. It was a great experience though, and I’m very glad that I did it. I’m also very glad that its done. Looks like my research project will be published in the fall as an article on an online education research journal, so I will be editing and condensing much of it. But that can wait till later in the fall. I have some relaxing to do. If you’re interested, here’s the abstract. 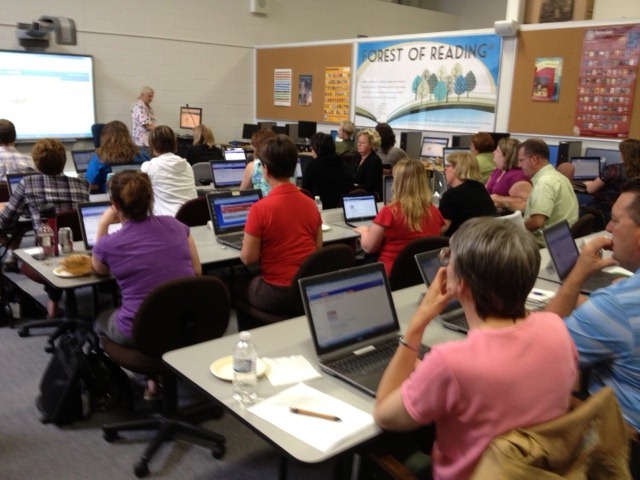 Much research has been done around how and why teachers integrate technology into classroom practices. Various factors have been shown to be important including teachers beliefs, attitudes, comfort, knowledge and skills. This has proven to be a complex mix with the outcome of technology integration depending, in various ways, on all of these factors. A need has emerged for a way to look at this complex mix of variables that takes into account the reasons teachers use technology and the tasks which they complete using technology. This kind of research tool could be used in a variety of ways to analyze these variables. This paper describes the outcomes of a project to develop a multifaceted, domain based survey instrument that looks at the frequency of use and confidence in the use that educators have with various technology tasks, as well as the importance that they place on these tasks for personal and professional use. The instrument was then tested on a small group of teachers in a school board in Ontario, Canada and the data was analysed to determine if it could be used in broader studies to answer such questions as have been posed in the literature. The results show that the instrument will be valuable in showing how educators’ beliefs are connected to the frequency of use and confidence they have in certain technologies. It should also be able to determine if those beliefs change over time and if this translates into changes in technology use. It was less clear if the instrument would be useful in determining how educators’ personal and professional use of technology was related and further refinement for this purpose could be considered. When did it start for you? Earlier this week, I saw some posts and discussion from my friends and colleagues @thecleversheep and @zbpipe about a framework that they had developed around the idea of connectedness in a Professional Learning Network context. I found the idea of being able to parse out how relationships can exist in multiple ways and that this existence can lead to the richness that is a PLN. I urge you to check out the original post and thinking, as well as the follow-up infographic. It makes a nice introduction to the concept for people who maybe have not participated in any sort of online network as a professional. Like all good things do, it got me thinking. I remembered a conversation about this from ECOO with @danikabarker and I got to wondering when this whole thing began for me. Thanks to my ability to look back in my personal time machine (my work calendar in the FirstClass email client) I was able to pinpoint it. On October 8, 2008 at 9:00 am, I participated in an Adobe Connect conference with Suzanne Riverin, who was our Regional eLearning Contact about some work I was doing in preparation for presenting at a regional conference on eLearning later that month. She thought that I should meet and talk to one of her colleagues about some of my ideas. It was at that time, that I was introduced to Rodd Lucier, who I came to know as The Clever Sheep, and through whom my journey to online relationships was kick-started. It’s so interesting to reflect on this all now, and how these relationships have expanded and crystalized over the years. I have more stories about other PLN’ers, but those can wait for another time. So, how did it start for you? June 2004 Transit of Venus, a photo by colin.jagoe on Flickr. 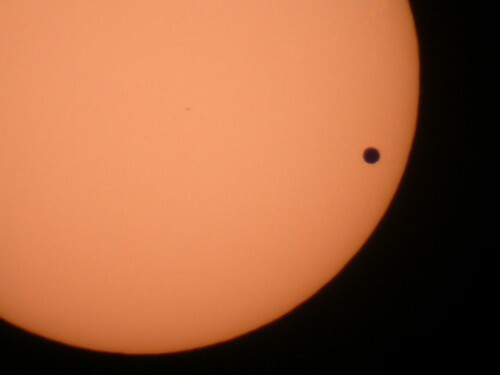 Taken in June 2004, during the first Transit of Venus in over 100 years. We set up our solar telescopes outside the high school, and were joined by a group of intrepid students and teachers for this twice-in-a-lifetime opportunity. If the clouds co-operate tomorrow, we’ll have the 2nd of those two chances, and none alive now will get to see the next one. Unless the singularity happens and we are all living heads on robot bodies. Only then we may have a chance to see another. Just like seeing a solar eclipse, you can’t look at the sun, you need eclipse glasses, or a special filter for the FRONT of a telescope to block most of the light. Be safe out there!